How do you capture someone’s attention online in a matter of seconds? A matter of words? For businesses, breaking through the ever-crowded web of news and conversations to reach consumers and inspire action is a particular challenge. 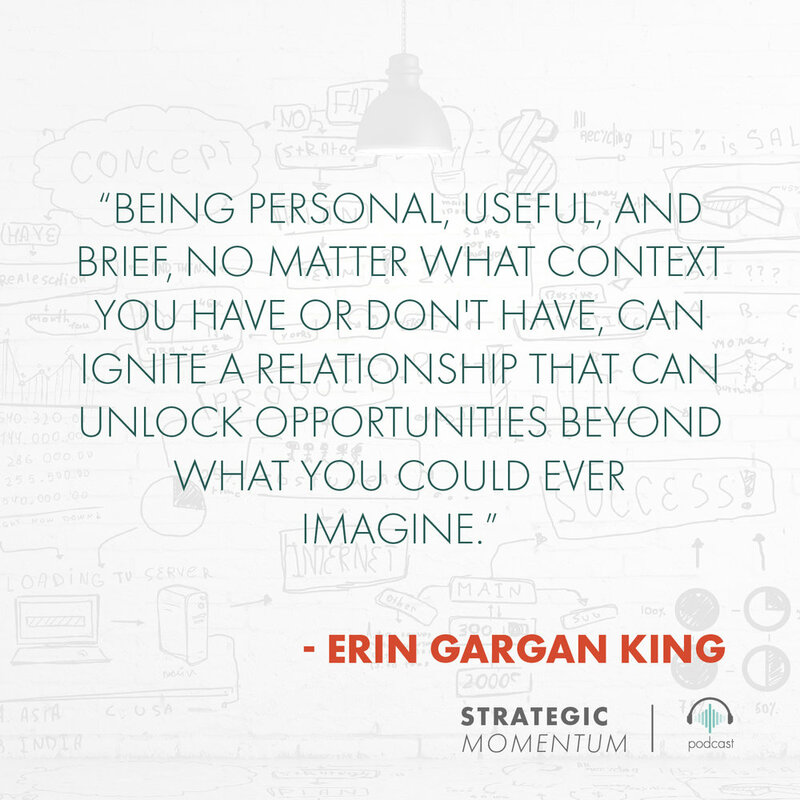 Erin Gargan King has spent years mastering the art of activating audiences online, and in this episode, she shares how to get noticed online, build real relationships, and positively influence the people on the other side of your screen. Erin is the founder of Socialite Agency, a global social media firm, and the best-selling author of Digital Persuasion: Sell Smarter in the Modern Marketplace. Erin’s entrepreneurial story began in Baltimore, where she was an ad sales rep for a local TV network. Her boss taught her a critical lesson: earning sales = survival. And Erin realized she was pretty good at it. She held onto that survivalist mentality when she left that job a few years later and started her own agency, Jump Digital Media. She was only 25. Jump Digital built websites for big name brands, like IMAX, Black+Decker, and Whole Foods, but soon Erin realized social media was the next frontier. She sold her company and started a new one, PMS.com. “It was a dollar shave club for women's tampons.” After reaching 25,000 subscribers, she sold that company as well. Next came her current business, Socialite Agency, a social media company for events. Socialite started as the typical bootstrapped startup operating out of her dining room in Laguna Beach, CA. But as soon as she landed a huge client, she started earning enough to hire a big staff, purchase and decorate a beachfront office, and throw lavish client parties. For a while, she thought she had made it – until that client abruptly ended its contract and Socialite nearly lost it all. Having to start over from scratch, back operating out of her guest-room-turned-office, Erin resorted to her sales survivalist roots. She needed new clients, fast. Erin sent out hundreds of long-winded, self-promotional emails and LinkedIn messages, but she got no response. She grew desperate. To capture attention, she realized she had to be different. She studied sales techniques that worked on her and found patterns in those messages: brevity and personality; offering help, not pitching a sale. She adopted the practices that worked, started seeing responses, and got her company off the ground again. Thus began her reign in the field of digitally persuasive communication. The fundamental principle of digital persuasion, as Erin explains, is using social media and email to build relationships online, and not make digital cold calls. Capturing the attention of your audience starts with letting go of the “me” focus, removing the word “I” from your emails, and gearing your language toward your audience’s needs and interests. Erin emphasizes putting yourself in the shoes of the recipient and warns that if you don’t understand how they see you, then you’re messaging won’t be effective. Keep your messages personal, useful, and brief. Don’t ask for something, rather provide value. You want your audience to see you a friend, not a seller. Stay away from automated message response services. Whether you’re looking to win a new client, or get thousands of consumers to buy your product, your mission is the same: be the authentic human friend in the sea of scripted robot salespeople. Digital communication has lead to the online disinhibition effect, the asynchronous communication caused by delayed responses that emboldens people to behave in a manner they’re not bold enough to behave in real life. Because of this, people tend to be less friendly, and more me-focused communicators. But to build relationships online, you have to maintain the candor you would hold in person. We tend to talk about ourselves about 80% of the time online -- double the amount of time is when we're offline. That kind of self-focused approach to communication is the opposite of persuasion. To be persuasive, you have to try to put yourself in the other person's shoes and see it from their point of view. When you open your communication, delete yourself. Don’t say, "I think,” “I feel,” “I want,” “I just wanted to reach out,” “I was hoping to connect,” “I want to pick your brain." Just say what you want to say. Using the word "I” not only limits your persuasiveness but it also makes you seem more junior. In fact, more senior executives tend to use the word "I" four times less than junior executives (those that have been working around five to seven years). In about 10 words, 2.5 seconds (the length of a mobile preview), the brain categorizes messages into friend, foe, seller or server. So that preview message is really all you get for someone to decide whether or not they want to engage with you. Differentiate your opening line. Remove niceties like, “I hope you get a great weekend" that make you look like everyone else in the inbox. Start with something personal about the recipient. Just leading with someone, something, or somewhere that that person cares about first, you will automatically stop the scroll because you get their attention. Remember that your recipient is categorizing your messages. You want to make sure that when they're opening your message, you position yourself as either a friend or a potential friend. This is called a server. You don’t want to be categorized as a foe which is a seller. Anything more than one scroll on a mobile device is too long. Cut the copy. Show, don't tell. Brevity in person is rude, but online, it's respectful. Offer your audience something of value so they feel like they want to reciprocate. They might go visit your profile. How shoppable are you? Is your deck there? Is your video there? Are your customer testimonials there? Make yourself viable, as opposed to always trying to sell. If you want to start a business, if you want to try a new initiative, test it. Try to ensure that a little bit works first to set yourself up for success. And then, take that risk, but take a calculated one.